When we tell you that we’ve found your ultimate summer getaway spot, where does the mind wander? 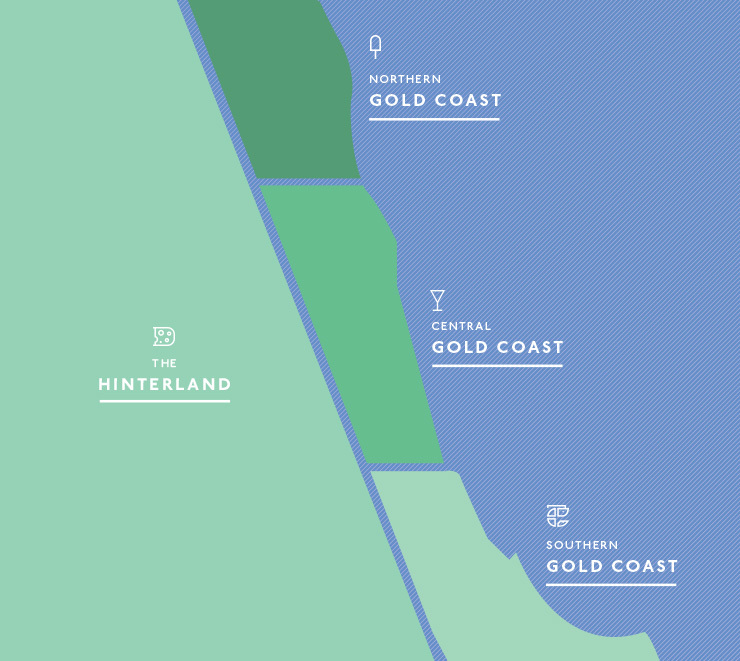 The Gold Coast probably isn’t where you think of straight of away. But, we’ve got news for you: it needs to be. With four stunning regions each boasting a whole heap of epic eats, secret waterfalls, hikes, and hidden beaches, you really need to ask yourself where you’d rather be—‘coz we’re pretty sure there’s nowhere else you’re going to want to go this summer. Allow us to help you find the perfect GC spot to hit up this Summer. Or do all four of its regions—why wouldn’t you?! The Southern Gold Coast is kind of amazing; it stretches from the clear waters of Coolangatta (hello international airport!) to the indie/boho shores of Burleigh. 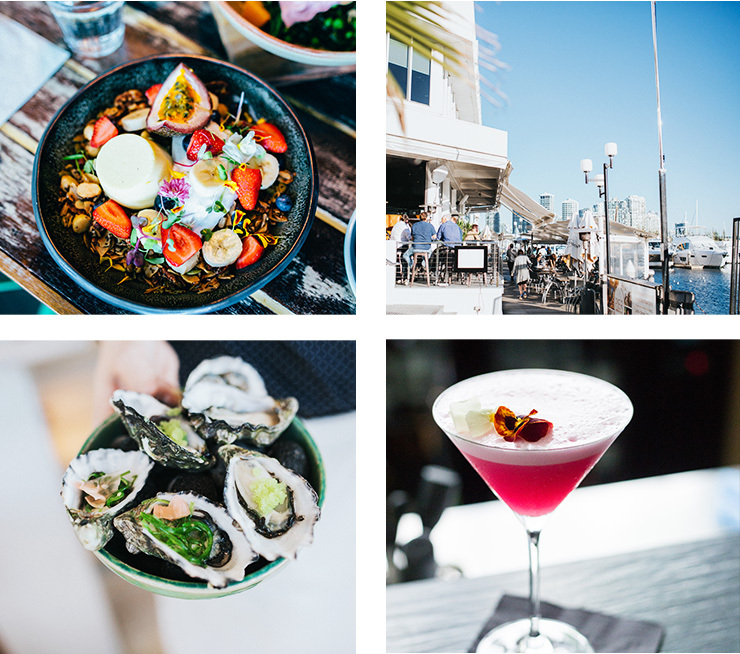 This section of the Gold Coast has no shortage of epic eats, that’s for sure. 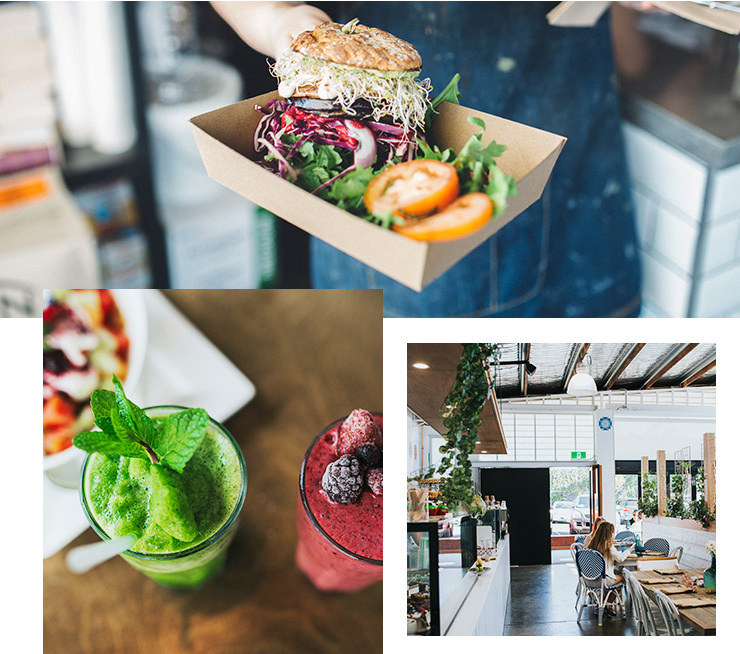 Check out Beach Burrito Company in Coolangatta for beachside burritos, Café Dbar for breakfast, Rick Shores for a literal beach side Aperol Spritz or Justin Lane for roof-top tipples, and Black Sheep Espresso or Commune for your coffee fix when away from the big smoke. For wave-free beaching, try Tallebudgera creek (it’s also an epic SUP spot) or the Currumbin Rock Pools or creek. 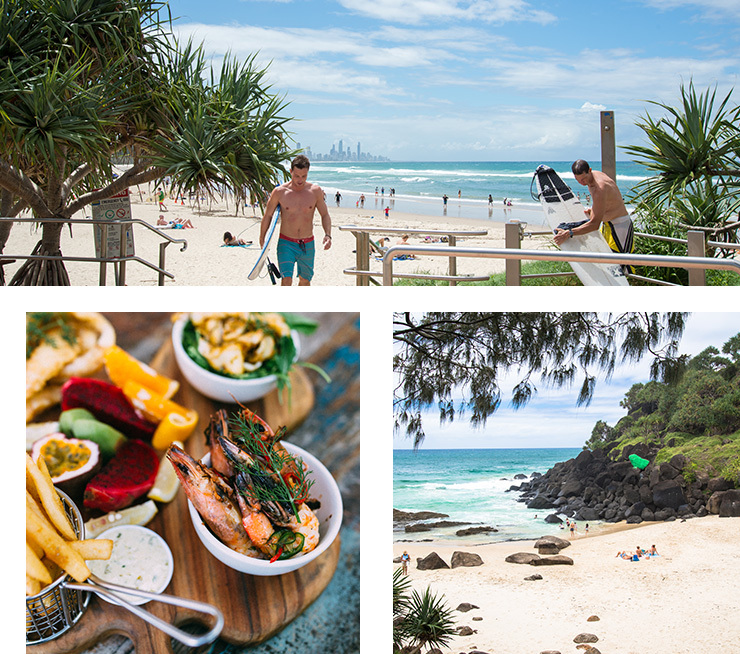 Coolangatta, Burleigh and Palm beaches are all perfect for beachside hangs and a good old dip in the sea—but, if we’re being honest, Froggies Beach is our fave for swimming! If you’re feeling adventurous, try the walk through the Burleigh headlands and keep an eye out for whales! The central coast is where it’s at: shopping, shopping and more shopping with a side of beaches and party vibes. Stay sky-high in one of the regions many sky scrapers or snoop out an apartment to call home from some epic accommodation on the Gold Coast. For breakfast and your caffeine fix try Biscuit Eating House, Greenhouse Canteen or Elk Espresso, plus, you can’t miss Palazzo Versace for a dose of luxe. For drinks, try the Little Mermaid, Social Eating House and Aloha Bar and Dining. The GC (and potentially Queensland’s) best kebabs can be found here too, at the subtly yet aptly named The Lamb Shop #HangoverSorted. If you’re after shopping, Pacific Fair is a destination in itself and home to all your fave designers (time to splurge on Prada, we think) and you just can’t beat Cavil avenue. There’s plenty of adventure to be had here too, with the Central Gold Coast playing host to the infamous GC jet ski safari! The Northern shores of the Gold Coast are kind of a hidden gem, often left unexplored by tourists (and Southern GC locals). This means that they’re perfect for tourists to visit because, who wants crowds, right? If you’re feeling healthy (or you’re vegan) be sure to visit Blendlove for a health fix. Coffee-cravers take note of Percy’s Coffee who dish up arguably the best coffee on the GC. If you’re after a few bevvies (aren’t we all?!) then hit up Café Catalina or Cabana Bar and Lounge. Sanctuary Cove is the home of undisturbed resorts (some are even eco friendly!) so the Northern GC is where you’ll want to go if you’re after a good old fashioned relaxing holiday. Yes, they exist! The Gold Coast Hinterland is potentially Australia’s best kept secret. Full of rain forests, wineries, waterfalls, cheese and hidden retreats, we think you’re going to love the hinterland. 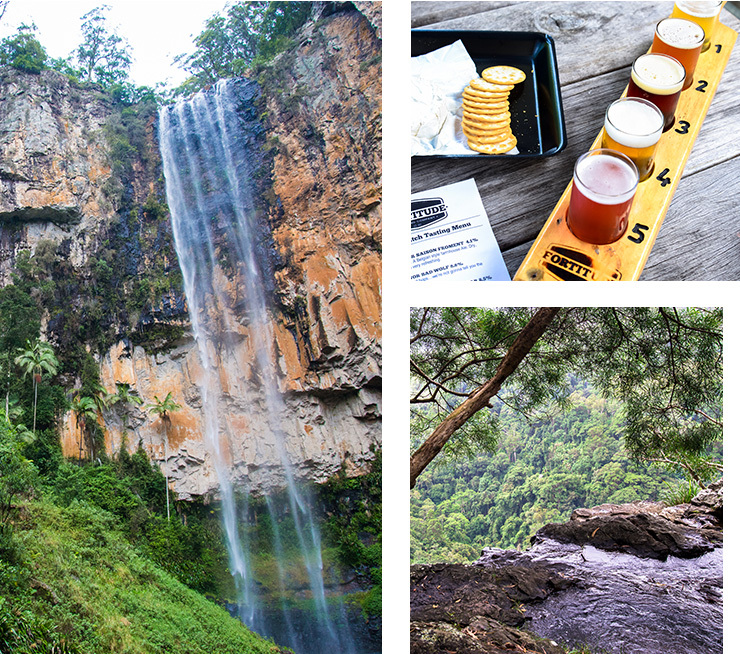 Tamborine Mountain is a hotspot for fun with Witches Chase producing delicious local cheese in an architectural delight of a place, while the Tamborine Rainforest Sky Walk and glow worm caves, plus Cedar Creek Estate delivers the goods—don’t forget about Tamborine Mountain Distillery either! Cedar Creek Falls is also the perfect spot for swims under the waterfall, without having to hike for 3 days to get there. A trip to the hinterland can’t miss Springbrook National Park and the Natural Bridge. Plus, you’ve just got to hit up O’Reillys. The hinterland is the GC for those who hate the beach, sand and sky scrapers. This article is sponsored by Gold Coast Tourism and endorsed by The Urban List. For more information on our editorial policy, please click here.